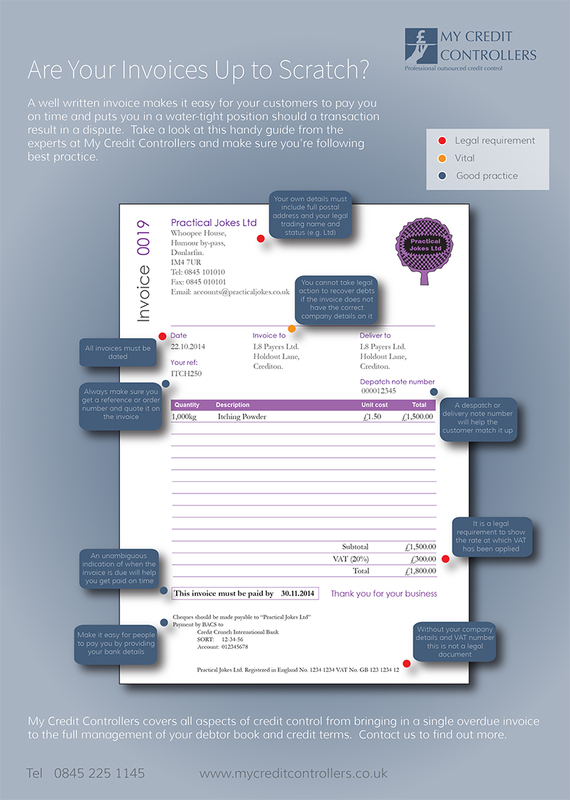 When is the last time you updated your invoice template? If you haven’t looked at the details of your invoices in a while, then now is a great time to check that it is meeting all of the legal requirements and is up to scratch when it comes to getting paid on time. If you issue a VAT invoice that includes zero-rated or exempt goods or services, you must show clearly that there is no VAT payable on those goods or service. If you’re a sole trader and you’re not registered for VAT, then you don’t have to comply with all of the rules above – however it’s still a good habit to follow to them as best you can. That way your invoices look clear and professional, making it easier for you to get paid on time and also avoiding any unnecessary queries from HMRC, your accountant or your customers. Now that you have covered the legal requirements, what else can you do to make your invoices work more effectively for your business? Remember an invoice is not just a legal formality, its your notice to the customer that payment is now due for goods or services as agreed. It is vital for your cashflow that you get it right first time, any error or omission of detail could result in the client delaying payment. The last thing you want is to get a call from your customer querying the invoice you’ve sent them. Make sure your invoice contains your company logo to make it easily identifiable. Make sure the description of what you are selling them is as clear as you can, reference any despatch note numbers where applicable as this will make it easier for the customer to match up and process. If your customer can see exactly what they’re being invoiced for, they’re less likely to query it and, hopefully, won’t delay paying you. Remember your customers are busy people and the more hassle it is for them to pay you, the more likely they are to put off doing so. Therefore make it as easy as possible for them to give you the money they owe. Show the payment terms clearly and always specify the date it will become due and remember to always include your bank account details on your invoices as many people prefer to pay electronically.